Cats seem like such low-maintenance pets that it’s easy to wonder if you’re doing everything possible to keep them happy and healthy. Is there something else you could be doing to enrich their lives? With information from WebMD, PetMD, Health, and WikiHow, here are 9 tips for helping your cat live all 9 of his long, healthy lives. Cats that spend time roaming outside only have an average lifespan of 2-5 years, while an average indoor cat can have 15-20 healthy years. Outside dangers include diseases, wild animals, cars, and people. Intact cats are more likely to escape your house in order to mate. While you might think your cute cat should have a litter first, keep in mind that over a million cats are euthanized every year due to overcrowding in shelters. 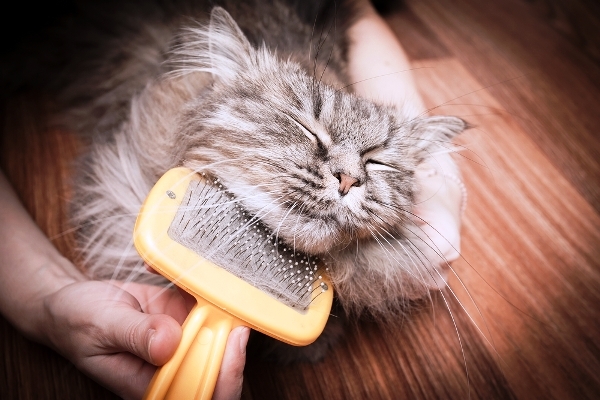 Regular brushing helps reduce hairballs and shedding, prevents matting, and can be good bonding time between you and your cat. Make sure your cat always has access to clean, fresh water. Also consider switching your cat to wet food. Wild cats get most of their moisture from their food and it’s unnatural for them to drink from bowls. Cats tend to get bored with their toys easily, so keep some in a closet and rotate the variety from time to time. Also be sure to engage your cat in play instead of waiting for them to play by themselves. Obesity is as much of a problem with cats as it is with humans, so regular play is crucial for keeping your cat healthy. 6. Clean the litter box daily. Scooping out the litter box daily not only directly affects your cat’s health, it can affect it indirectly as well. You’ll be able to notice any changes in your cat’s bathroom habits immediately, such as more urine, loose stool, or blood in the litter. The sooner problems are spotted, the sooner you can get your kitty treatment. 7. Avoid giving your cat (most) human foods. Many human foods, including milk, are not well-digested by cats and can even be toxic. If you really want to share fresh snacks with your cat, talk to your vet first to make sure they’re feline-friendly. 8. Provide a scratching post and encourage your cat to use it. 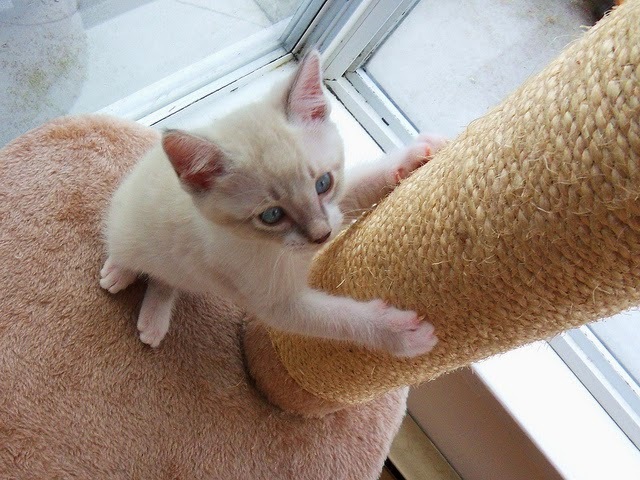 A scratching post will not only protect your furniture, it will give your cat something to claim as their own and make them feel more at home and in their own territory. 9. Monitor their eyes, ears, teeth, and feet. Following these simple tips will give your kitty the best chance at a long, healthy life. We invite you to our online pet store with all the supplies your pets need: go to the Pet Shop.